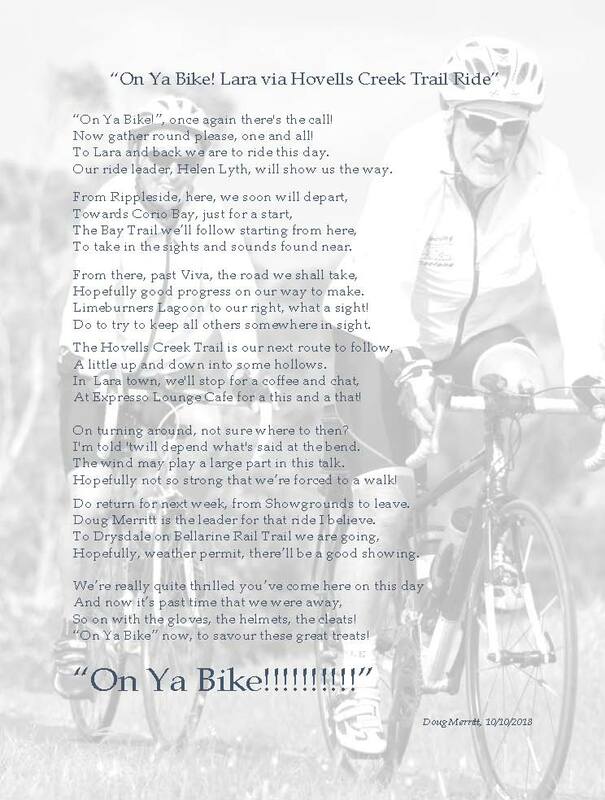 Thanks to Dave Simpson for his take on Around the Bay 2018. Having experienced the difficult start at Rippleside last year (the start line had been placed at the beginning of the ramp up to the Esplanade, causing many people to fall off as they were starting in too high a gear) we decided to hang at the back of the crowd and to let the crowd get out of the way. This worked well when we did eventually get going as for some reason the start was delayed by 15 minutes. We set off in the dark for Queenscliff, saying hello to some of our team of CG volunteers on marshaling duty as we went past. The ride down to Queenscliff was fine, no delays and importantly, no wind. We decided it was going to be hard to get onto the 8am ferry owing to the late start (and it would be crowded). So I decided to resist the calls of the people on ticketing duty at Queenscliff, who were trying to give us 8am tickets, and we held out for tickets for the 9am ferry and had a coffee, having found a seat in the sun at the Marina. Consequently the ferry journey was great, the ferry was only about half full and we sailed off into the fog which had come in from the bay. We arrived at Sorrento at 9:50am and got straight out on the road and made good time, stopping off a few times for necessary ‘natural breaks’. There was still just a very light wind, cross/tail, and the other riders were well behaved. I think we had managed to fall into a very well placed time window as the 210km riders hadn’t arrived yet and the 200km ‘Sorrento Return’ riders were just arriving so we didn’t have to contend with too many large pelotons whizzing past! 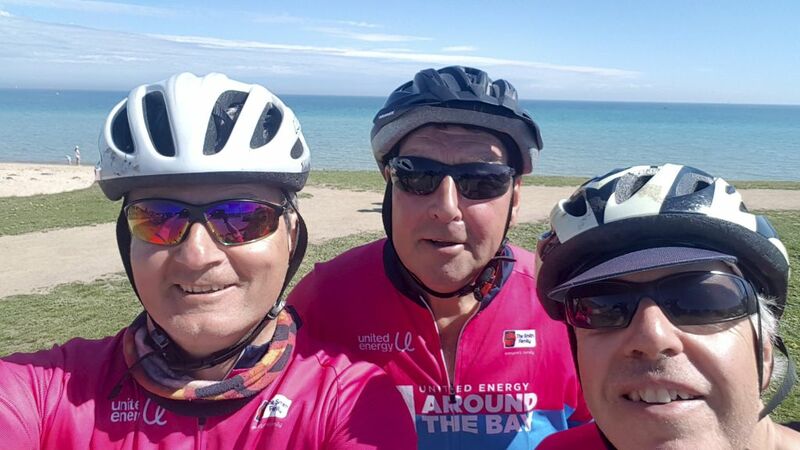 We eventually got to our lunch stop at Frankston and after a nice rest in the sun we headed off for the final run, with the wind, up to the finish at Albert Park, making sure that we crossed the finish line together! 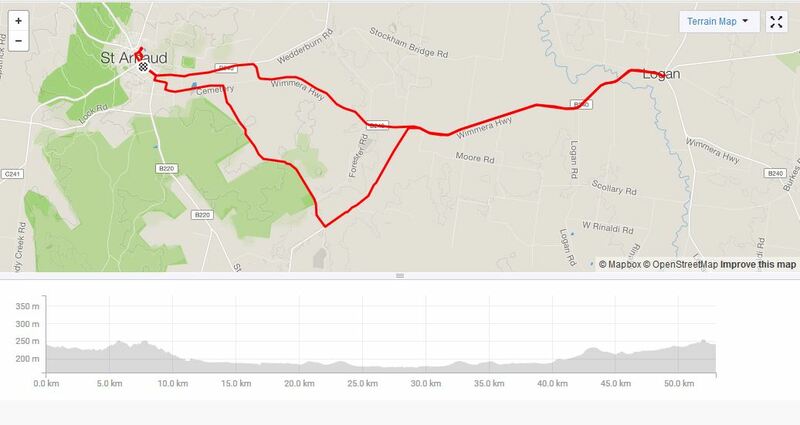 My certificate says my total ride time was 7hr24m, and my Strava timing says I did the 100km Sorrento-Melb in 4hr41m, including a 30min stop for lunch. Our average speed was 22km/hr. After (another) coffee we set off to Southern Cross to get the train home. 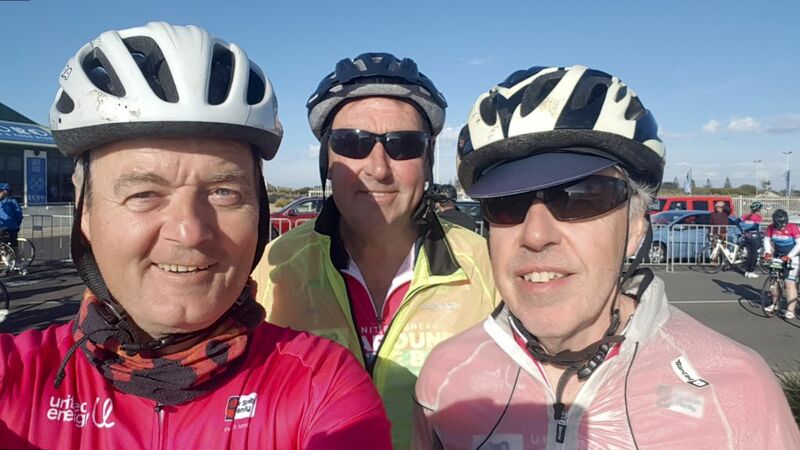 A big thankyou to my fellow riders, Pete and Richard, and to the team of volunteers. Thanks to Stephanie for this ride report and photos. Geoff and I rode the 50km Route from Albert Park to Williamstown and back. The day was fantastic with perfect weather conditions for riding. 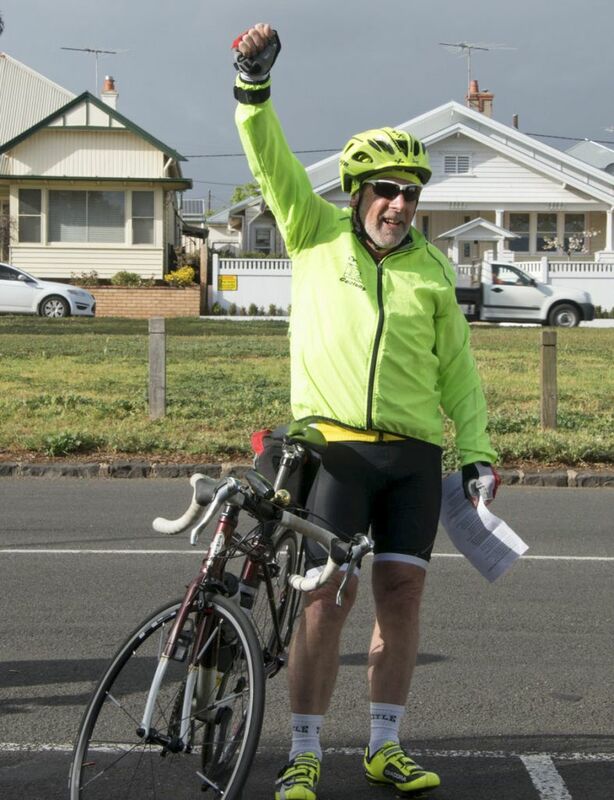 With 10,000 riders registered for the day riding from 20-210 kms it showed the motorists on the Westgate Bridge …. cycling is now here to stay and grow! Geoff and I had no issues with the younger kids, most riding responsibly all day. The climb over the Westgate Bridge and back wasn’t hard and we had plenty of room taking up 2 lanes of the bridge.The views from the top were superb, many stopped and took photos. 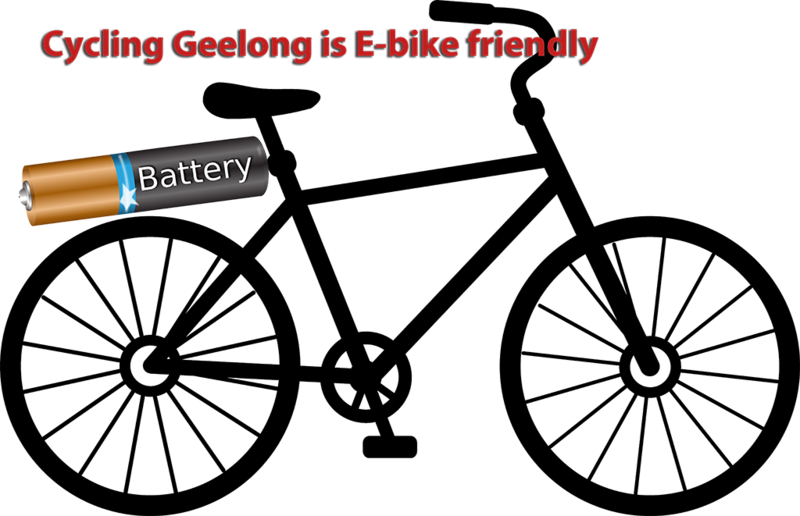 With over 80 cyclists registered as Members of Cycling Geelong it would be good to see a Team of 6 to 8. 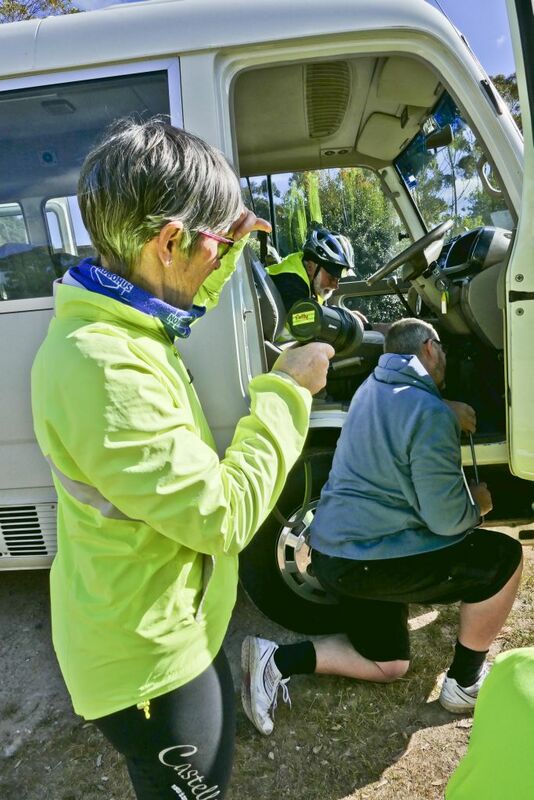 If you participated in Around the Bay, or volunteered the event, please send in a ride report and your photos so we can share them with other club members. Send to Helen. Even the best-planned tours can have issues. 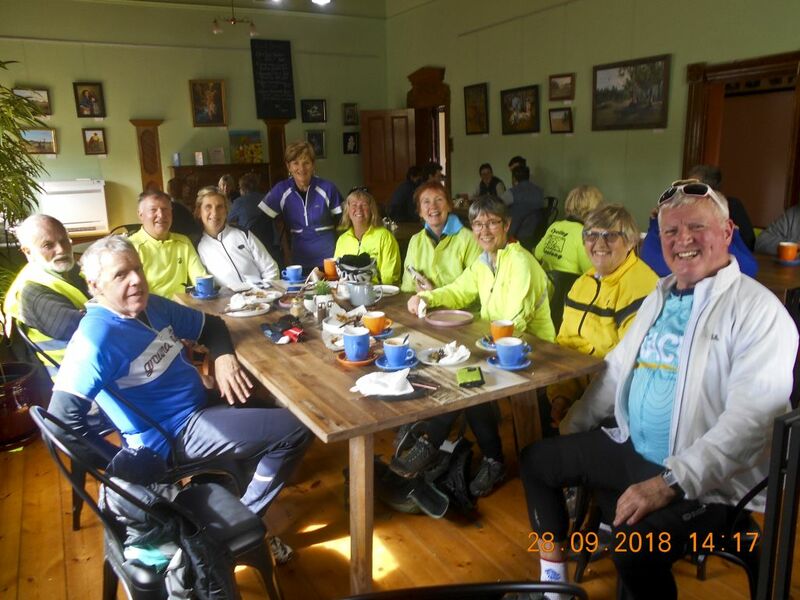 As the group packed up their belongings and prepared to cycle out of the St Arnaud Caravan Park for the last time, something entirely unforeseen happened. The bus, which had behaved perfectly for the entire time, developed a jammed accelerator! Stephanie and Geoff must have had a premonition of this. They had chosen to travel independently on this final day. Nick, our valiant and technically competent bus driver got to work to solve the problem, with some assistance – a small amount of which may have been helpful. 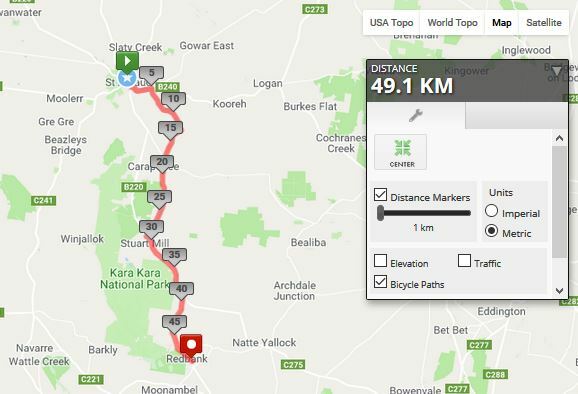 Finally, at around 9.20, the problem was resolved, and the cyclists set off for Carrapooee (a crossroads in the midst of farmland), Stuart Mill (an old mining settlement) and Sally’s Paddock winery for lunch. It’s that way and we’re running late. Because of the late start, some cyclists opted to continue in the bus. Others sprinted valiantly down the highway. Kelly had to back track to retrieve his gloves, but was soon in the lead again. Helen was the first to arrive, only to be informed that the booking was for 1pm, not noon! Texts to key people followed, and the riders could ride at a more leisurely pace. 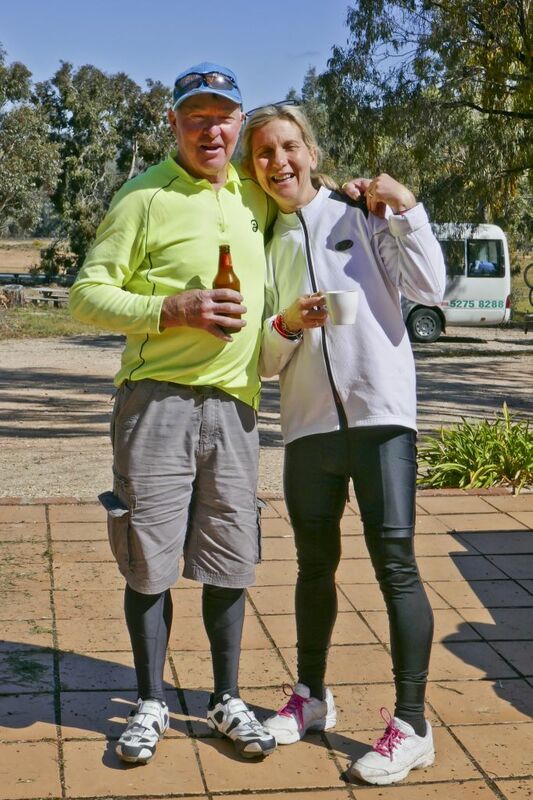 After coffee, and a wine tasting for Helen, the first cyclists appeared, triumphant with their achievement – a 50km ride, including sprinting, gravel and hills! More coffee was drunk, other drinks ordered, and Nick, Kelly, Kevin and a few others loaded up the bikes on the trailer, before a final lunch together. An old style outdoor dunny. I’ll try a bit of this one. Karen phoned Allan to thank him for all his planning. Thanks Karen and Kelly for a wonderful weekend. Thanks to Karen and Kelly, our leaders and joint organisers with Allan. 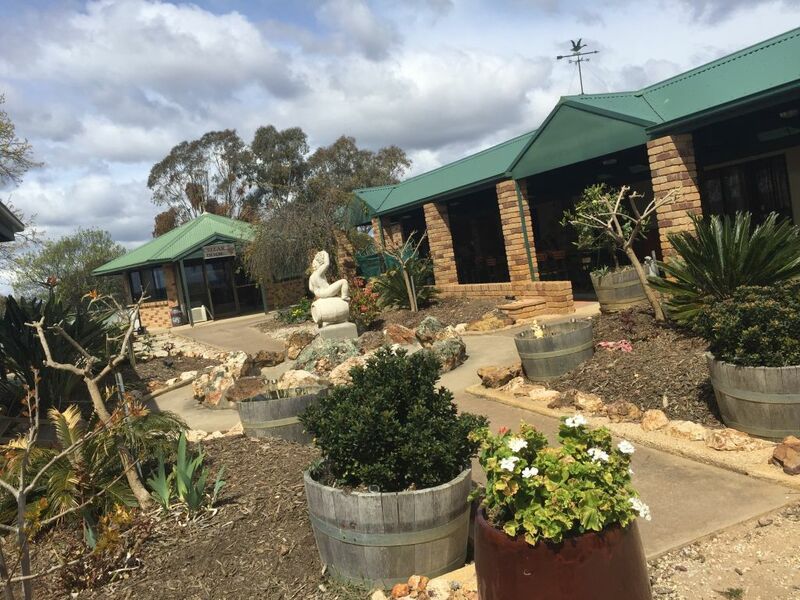 For those who’ve never been on a Goldfields tour with Allan, they are highly recommended. Allan is already considering the best place for next year’s tour! It will be important to get in early as the Grand Final weekend is always popular for travelers. The ride headed out via quiet unsealed country roads to the Wimmera Highway and then on to the Logan Pub. The return was via the Wimmera Highway. There were several stops to re-group, and visit friendly local horses. Part of the trail was along the Henty trail, which goes from the Murray to Portland. Margy discovered some new wheels at the Pub. The three motorbikes stopped just as we pulled up. Our stereotypes were thrown away when the bikies ordered coffee! The riders returned to the Caravan Park in time for the important TV coverage of the game. Not all were happy with the outcome. A barbecue helped drown a few sorrows. No swooping maggies this year. Thanks again to Kelly and Karen for exemplary planning and leadership, and to Stephanie and Geoff for organising food for the barbecue.